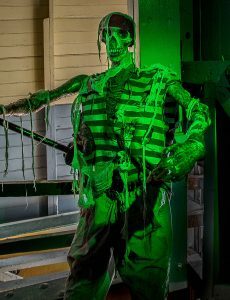 Take a tour through the Special Spooky Pirate Show created by ScreamDimension – .................. if you dare! They were fearless and cunning until the tides turned and the pirates sailed into a dimension of unimaginable transformation. Do you have the courage to enter the Pirate’s Terror? Warning: Show may be upsetting for some youngsters – use discretion. Children 6 and under must be accompanied by adult. Show intensity will increase after 8pm. in the Langham theatre – enter at the backdoor.